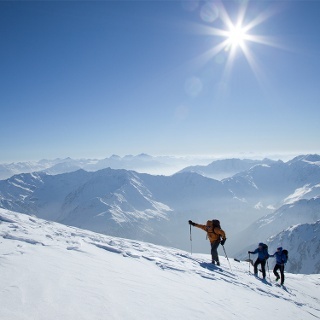 / Direkte Abfahrt von der Hochvernagtspitze 3535m über die mehr als 40° steile, direkte Südflanke. Machbar nur bei perfekten Firnbedingungen. / Tolle Firnschwünge am Vernagtferner. / Wir orientieren uns vorerst weiterhin entlang der 1850er Moräne taleinwärts. / Der Blick gegen Norden zum Vernagtferner. / Blick gegen Süden ins Rofental. 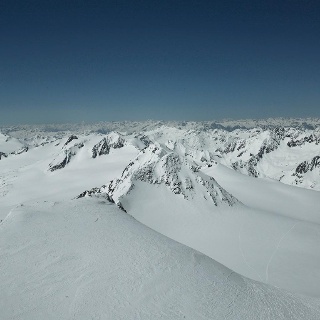 / Schöner und weitläufiger Aufstieg hinauf zur Hochvernagtspitze 3535m. 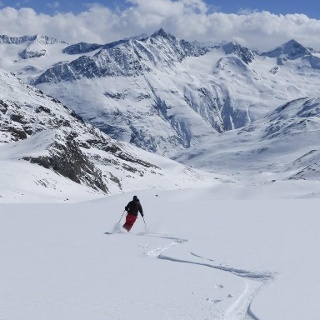 / Wir nehmen diesmal die Ski mit zum Gipfel. 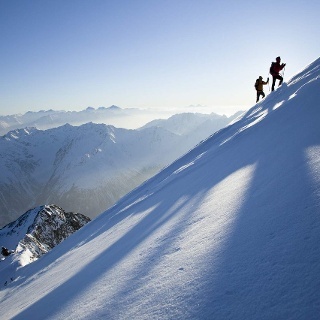 A dream ski tour to the Hochvernagtspitze, even if the last meters demand alpine experience and stability. The Hochvernagtspitze is the second highest ski peak of Vernagtferners and makes it one of the most attractive destinations in this area. The Hochvernagtspitze 3535m is the second highest ski touring peak in the direct reach of the Vernagtferner after the Hintere Brochkogel 3625m. But it is not only this fact that makes the mountain one of the most attractive destinations, but also the relatively easy accessibility of the summit, even if the last meters also need alpine experience and tread safety. From the Vernagtbach it is best to move the ascent to the west of the two glaciers, which flow from the Hochvernagspitze 3535m towards the southeast. 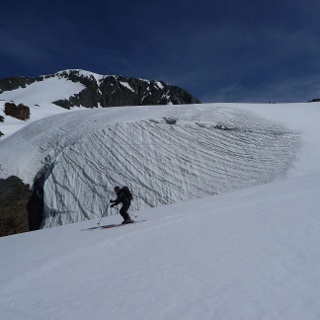 In this area you can find a clear, extensive and not too steep glacier terrain. In the spring you can also be quite sure that the snow cover is already well set. 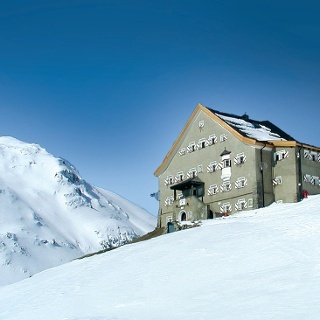 The ski depot is tried as high as possible at the top of the ridge. This requires a safe and skilled ascent technique. Less practiced will pass the Stapf through the 40-degree southern flank. The last meters above the West Ridge, and then the short, but steep uphill climb to the summit, should not be a problem for the snowboarders. 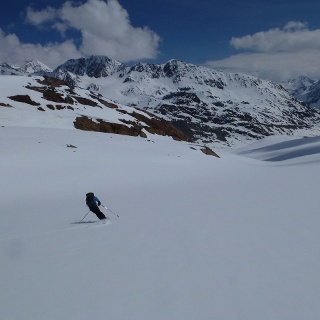 In the descent you can go down to the top of the ascent zone, where the glacier is fainter and the terrain less steep, or you can choose the more racy, but also in the descent, where you can enjoy the best descents Steeper and more columnar variant over the glacier directly to the southeast.